Grandparents Raising Grandchildren Need to Learn Current Health Advice or Risk Endangering the Kids. If you are a grandparent raising grandchildren, you deserve a lot f credit. Even so, be certain you’re up on current health advice about childrearing. A lot has changed since you were bringing up your own children. Many grandparents raising their grandchildren practice outdated health and parenting myths that could potentially pose serious risks to young children, according 2017 research done by a Northwell Health pediatrician in New Hyde Park, NY. The study, one of a trio led by senior investigator Andrew Adesman, MD, was presented at the Pediatric Academic Societies Meeting in San Francisco from May 6-9 2017. Dr. Adesman, Chief of Developmental and Behavioral Pediatrics at Cohen Children’s Medical Center in New Hyde Park, focused his research on the particular difficulties facing grandparents solely raising their offspring’s children. More than 7 million grandchildren in the United States were being raised solely by their 2.7 million grandparents in 2012, according to the US Census Bureau. Factors contributing to this growing phenomenon include the opioid epidemic, parental incarceration or problems with parents’ physical or mental health, Dr. Adesman said. In the decades since grandparents raised their own children, certain parenting practices and health beliefs have evolved – catching some grandparents unaware and potentially threatening their grandchildren’s safety. For example, in one of Dr. Adesman’s studies, “Potential Health Risks to Children When Grandparents Raising Their Grandchildren Subscribe to Out-Dated Health Beliefs,” 44 percent of the 636 grandparents who completed a detailed questionnaire mistakenly believed that “ice baths are a good way to bring down a very high fever.” In fact, ice baths pose a hypothermia risk. Perhaps more notably, nearly one-quarter of these grandparents did not know that “infants should be put to sleep on their back, not on their stomach or side” – a major risk factor for sudden infant death syndrome (SIDS). 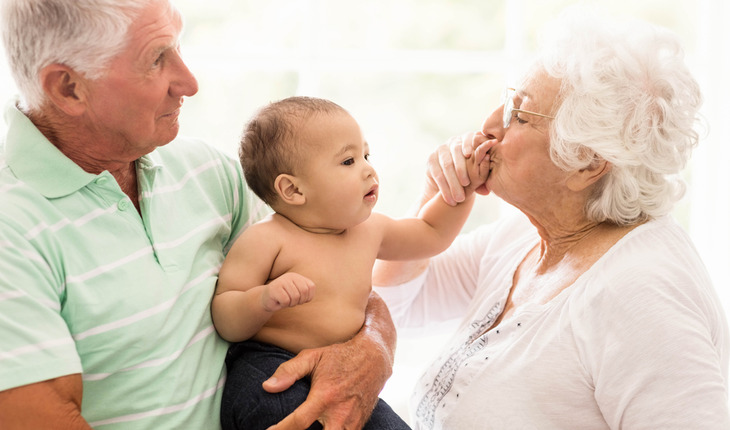 Pediatricians can help grandparents raising their grandchildren by updating them on current health care beliefs and parenting methods, Dr. Adesman said. “It’s important that pediatricians not make the mistake of taking for granted that because these grandparents have raised children already, they have the wisdom of the ages,” he added. In his two other related studies, Dr. Adesman and his team surveyed 774 grandparents who identify as the primary caregiver of one or more grandchildren. One questionnaire aimed to characterize these grandparents’ sources of support and evaluate their impact, as well as identify unmet needs for support. The study, “Adequacy of Psychosocial Supports for Grandparents Raising Their Own Grandchildren,” showed that one in 10 grandparents reported they didn’t have any support systems at the time they answered the survey, while an additional 12 percent said their support system didn’t meet their most important needs. In addition, 71 percent reported that their parenting responsibilities had limited their ability to socialize with friends, and nearly one-third indicated that raising their grandchild had affected their spouse or relationship unfavorably. “One major takeaway from this study is that for grandparents who are raising grandchildren, their parenting can often take a toll in terms of their own physical and emotional health, and support groups can make a difference,” said Dr. Adesman, noting that grandparenting support groups can be found in most major cities. Dr. Adesman’s remaining study, “Parenting Experiences and Self-Perceived Parenting Abilities of Grandparents Raising Their Own Grandchildren” covered parenting experiences, self-perceptions, challenges and other factors affecting these grandparents. Research showed that nearly one-third reported having a medical problem that interfered with their ability to care for their grandchild. Additionally, many said that choosing to parent their grandchild had negatively affected their own emotional (40.3 percent) or physical (32.4 percent) health.